Today labor migrants mostly move south to north across the Mediterranean. Yet in the nineteenth century thousands of Europeans and others moved south to North Africa, Egypt, and the Levant. This study of a dynamic borderland, the Tunis region, offers the fullest picture to date of the Mediterranean before, and during, French colonialism. In a vibrant examination of people in motion, Julia A. Clancy-Smith tells the story of countless migrants, travelers, and adventurers who traversed the Mediterranean, changing it forever. Who were they? Why did they leave home? What awaited them in North Africa? And most importantly, how did an Arab-Muslim state and society make room for the newcomers? 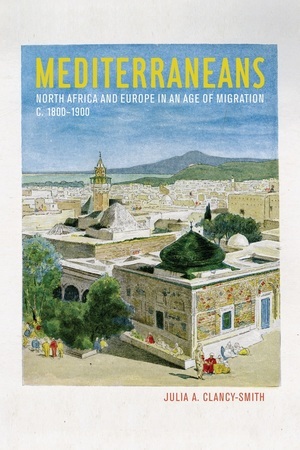 Combining fleeting facts, tales of success and failure, and vivid cameos, the book gives a groundbreaking view of one of the principal ways that the Mediterranean became modern. Julia Clancy-Smith is Professor of History at the University of Arizona. She is the author of the award-winning Rebel and Saint: Muslim Notables, Populist Protest, Colonial Encounters (UC Press), among other books. "In her groundbreaking study of population movements, Clancy-Smith reconceptualizes the nineteenth-century history of North Africa by inserting the 'missing' people into the social fabric. She shows the roles these Southern Europeans of modest means played in creating a borderland society whose impact continued during the colonial period. Mediterraneans opens new windows into power structures, labor history, issues of gender, and social and cultural negotiations, along the way replacing binary constructions with a much more complicated world. "—Zeynep Çelik, author of Empire, Architecture, and the City: French-Ottoman Encounters, 1830-1914.